Six races remaining in the 2010 Formula 1 schedule, the series' top-3 teams (Ferrari, McLaren and Red Bull Racing) have shown incredible parity with each other. Though Mark Webber delivered Red Bull Racing a second after the last race at the Belgium Grand Prix, the team's Renault-engined car appeared to have suffered a speed shortage on the low-downforce circuit. While the McLaren's Mercedes engine was rumoured to be down on power since the season's first race at Bahrain, a new rear wing and diffuser design allowed the British team to equalize pace with the high-horsepower Ferraris. With Italy associated as Ferrari's home territory, the hearts of the Italian auto racing fans probably skipped a beat when the prancing horse's driver Fernando Alonso soared to supremecy in qualifying Saturday afternoon. Taking the grid the pole position, the Spanard's Ferrari would be overtaken on the start by fellow front row sitter Jenson Button. As the one McLaren-Mercedes shot to the Italian Grand Prix's early lead, the other team car would not make it past the first lap. 2008 F1 drivers champion Lewis Hamilton collided with the #7 Ferrari of Felipe Massa resulting in a suspension break which saw Hamilton's Italian Grand Prix end in the gravel. Admitting fault in being over-anxious on the first lap, Hamilton said on his official website “I was trying to position the car in a certain way, I was too close to Felipe, and his left rear clipped my right front. The car was damaged after that, and there was nothing I could do; you try your best, but some things just don’t go your way". Felipe Massa was more fortunate as his Ferrari continued competitively after the contact. As the green flew for the Italian Grand Prix, the Red Bull Racing squad found the race to be a consistent struggle as both Mark Webber and Sebastian Vettel were out of touch with the top-3 runners all day. After setting fast time during a Friday practice, Vettel found through the weaker effort his Saturday qualifying that his Renault engine could have been down on power. Changing the powerplant prior to the grand prix start, the pace of Vettel's car was more hindered by a brake issue during the race. At one point, Sebastian Vettel allowed Red Bull teammate Mark Webber by for than 5th place. In regards to Mark Webber's pass on Sebastian Vettel, there was at least one allegation leveled by Speed channel reporter implying team order might have been communicated indirectly to Vettel. This speculation was based on Red Bull Racing team principal Christian Horner's apparent endorsement of team orders after an FIA ruling where no further penalties were levied against Ferrari for an incident in the German Grand Prix late July. While team orders for determining the outcome of Formula 1 races had been strictly forbidden, Ferrari's judging was said to be a "presedent" by Horner as the FIA did not punish the Italian team further for the German Grand Prix outcome. As Mark Webber is better positioned in the 2010 Formula 1 driver's championship where the 5th spot would help the Australian Webber, team orders were neither confirmed or denied on that occasion. While Jenson Button held onto the Italian Grand Prix lead, Alonso Ferrari maintained a very tight interval on the rear of the Mercedes-powered McLaren. Unable to completely break away from Alonso, a lap 39 pit stop by the Scuderia Ferrari team proved a deciding factor the Italian Grand Prix. Thanks to an ultra-fast pit stop by the Ferrari crew, Alonso was launched out of pit road ahead of Button's McLaren-Mercedes. Fernando Alonso's trademark skill on cold tires sustained his position at the front. In fact, Button narrowly avoided losing the runner-up position to the other Ferrari of Felipe Massa. As the top-3 maintained their position at the finish, Alonso won at 2.9 seconds on Button with Brazil's Massa rounding out the podium for the Italian Grand Prix. With Ferrari's 1st and 3rd at Monza the Italian supporters, known throughout Formula 1 as the tifosi, allowed horns to blare on the air and applause echo through the trees of the Monza landscape. In distant but hard fought 4th place, Red Bull Racing's Sebastian Vettel recorded the finish thanks to some pit stop strategy that recalled the German driver late in the race for his tire change. Nico Rosberg in 5th led the factory Mercedes GP team taking the position late from Red Bull Racing's Mark Webber. Rosberg said in post-race “Fifth place was an ok result today except for losing the place to Sebastian at the end there. It was a tough fight and I was pushing to the maximum throughout the race, firstly with Robert at the start and then with Sebastian towards the end. Finishing 6th, Webber was able to make opportunity from the somewhat off-colour effort as the Australian retook the driver championship point led from Lewis Hamilton. 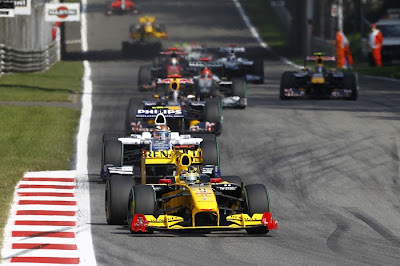 Williams F1 Nico Hulkenberg, Renault's Robert Kubica, Mercedes GP's Michael Schumacher and the 2009 Italian Grand Prix winner Rubens Barrichello in a second Williams-Cosworth were 7th through 10th at Monza. Following the 2010 Italian Grand Prix, the season's point standings are dramatically reshaped. Lewis Hamilton's zero-point day as result of his early retirement allowed Mark Webber to emerge 5 points in front for the Formula 1 driver's points. Fernando Alonso's win with Ferrari was the first time since 2006, the Spanish driver gained 20 points on the leader in the Formula 1 drivers championship. Alonso is only 21 points behind Mark Webber but Jenson Button is only 1 point behind him in 4th place in the standings. Salvaging a decent finish from a difficult race, Vettel's points gain allowed him to stand only 2 points behind Button.